Hennessy Artistry : The Global Art of Mixing 2011 set the tone for the party at Opus Lounge, Resorts World Manila, Pasay City on the night of 11.11.11. This is the second year in our country that Hennessy Artistry paired with only the best international and local acts with the world’s best cognac for its Halo event. Party-goers tasted some fresh flavors when enjoying Hennessy VSOP at the Hennessy Mixing Bar. Mixes available on the Henessy Mixing Bar are Hennessy Apple, Hennessy Ginger cocktails, Hennessy Citrus and Hennessy Berry. The Hennessy Mixing Bars was scattered all over the place with beautiful girls all prepared to mix some drinks for all party goers. The philosophy behind the Hennessy Artistry Halo is “The Global Art of Mixing”; the mixing of various genres of music and the blending of top talents and emerging artistes. Combining the acts with spectacular ambience and energy, an extraordinary experience is created. This showcases Hennessy’s art of blending in both cognac and music, by combining tradition with trendy innovation. This multicultural and vibrant series had already left waves of sonic fusions across the largest continents and over 40 countries from Hong Kong, Shanghai, Guangzhou, Beijing, Taipei, Tokyo, Kuala Lumpur, Hanoi, New York, Los Angeles, Miami, London, to Germany, Poland, Moscow and South Africa; becoming the international trendsetter of music and style. Hennessy Artistry Manila 2011 is a great success. The artists performed at the Hennessy artistry event came from many different parts of world and cover the entire spectrum of genres. From electro to hip hop to R&B to soul to trance to rock to house and everything in between, they will seamlessly come together live on stage. To all the wonderful performances of the two international superstar DJs – American DJ Andy Caldwell and Australian DJ Sky Nellor. Also playing will be veteran DJ Manolet Dario, the soulful Sinosikat? vocalist Kat Agarrado and it girl R&B/Rock artist Bea Tantoco. Thanks Hennessy for the USB. It's very useful to me in the office. :) Cheers to Hennessy and more power! More party to come! 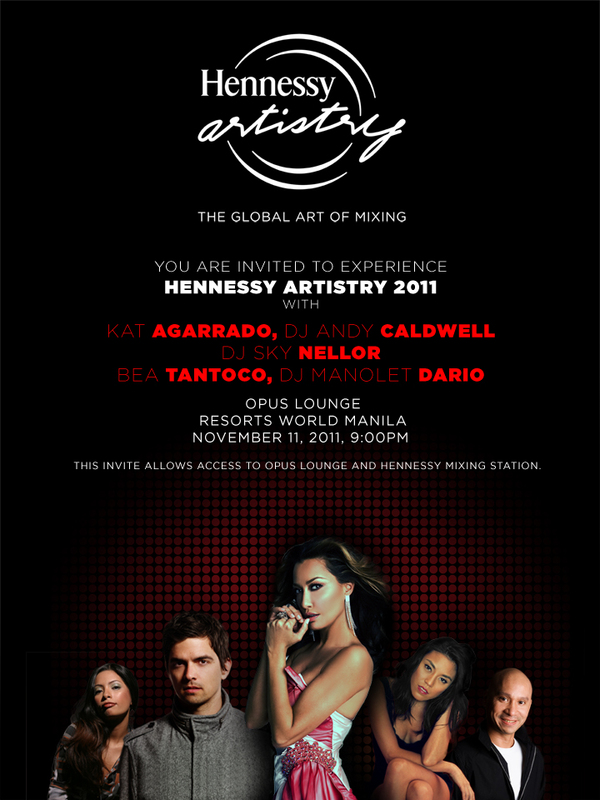 Check out the Facebook fan page, Hennessy Artistry Manila and follow @HArtistryPH on Twitter for more information about the event. I deserved a pair of shoes from Urban Athletics! Make it rain for Africa!